Some scientists mention the white-flippered little penguin as an 18th species, but most of them consider it as a subspecies of the little penguin. 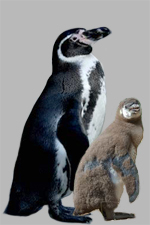 Pygoscelis : or brush-tailed penguins. Eudyptes :(beautiful diver) or crested penguins. 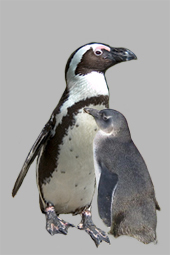 Spheniscus : wigtailed or banded penguins. with an orange/yellow patch on cheek and breast. © Kevin Schafer Emperor penguins are one of the two species which only breed on the fast ice all around the Antarctic. They never set foot on dry mainland. Only the male penguins hatch out the egg on their feet during the harsh Antarctic winter (June-Sept). Laying : May, incubation : 62 till 64 days. Emperor penguins are rarely found in captivity unless in the Sea World Parks in San Diego and Ohio. Photo, used with permission, by Kevin Schafer. 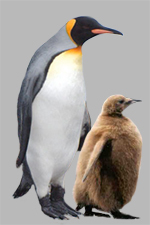 King penguins are found on many sub-Antarctic islands. Many zoos keep them, but one of the best known is Edinburgh Zoo in Scotland, where they take a walk through the zoo almost every day. In München and Hamburg (Germany) too, but only during cold winters, under 10°C. 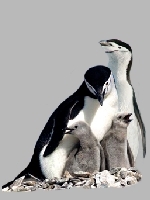 Habitat : Macquarie, Marion, Prince Edward, Kerguelen, Crozet, South Georgia, South Sandwich. © Kevin Schafer Adélie penguins are the second species which breed only in Antarctica. incubation : 35 days in October, November. 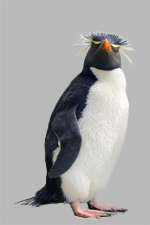 Habitat : coast of Antarctica, South Shetlands, South Orkneys, South Sandwich, Antarctic Peninsula. Chinstrap penguins breed on Antarctica and the sub-Antarctic islands around it. They are very noisy, and therefore sometimes called stonecrackers. They lay 2 eggs. 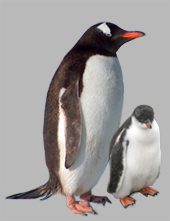 Habitat : South Shetlands, South Orkneys, South Sandwich, Antarctic Peninsula till 65°. Gentoo penguins breed on the sub-Antarctic islands in the Southern Ocean. Easely recognized on the white head-phone like stripe over their head. 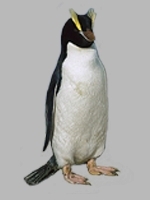 Habitat : Heard and Macquarie Islands, Falklands, South Georgia, South Shetlands, South Orkneys, Prince Edward en Marion Island, Crozet and Kerguelen, South Sandwich, North Antarctic Peninsula till 65°. African penguins (blackfooted or jackass) live around the southern African and Namibian coast. They are threatened by oil spills of passing tankships. In Boulders Beach , you can stay in a guesthouse, from your bed out looking and listening at African penguins. Magellanic penguins breed on the east and southern coasts of South America, on some off shore islands and in the Falklands. Habitat : south Chili, Patagonia (Argentina), Tiera del Fuego and Falklands. 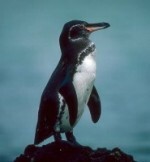 © i-bird.com Galápagos penguins: They are the most northern species, living in South America near the equator. Photo, used with permission, by i-bird.com. Erect-crested penguins live on several sub-Antarctic islands southern of New Zealand. Snares penguins live only on the Snares Islands, about 300 miles southern of New Zealand. It is a protected nature reserve, closed for tourism and visitors. Population : 23 250 pairs? © Dave Houston Fiordland penguins breed in the rainforests on the south west coast of New Zealand´s South Island and on Stewart Eiland (southern of New Zealand). Their survival is threatened by the increasing presence of people in the last wilderness, while dogs and other introduced animals chase them. Photo, used with permission, by Dave Houston. Habitat : south west New Zealand, Stewart Island. 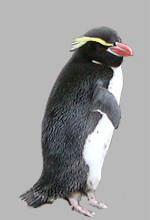 Rockhoppers are probably the most common widespread crested penguins. They lay 2 eggs, but only hatch out just one. Habitat : Tristan groep, New Amsterdam, St Paul, Heard, Macquarie, Staten, Falklands, Marion, Kerguelen, Crozet, Antipodes, Campbell, Auklands, Bounty, Tiera del Fuego. 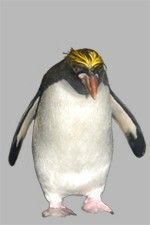 Macaroni penguins are the largest of the crested penguins. 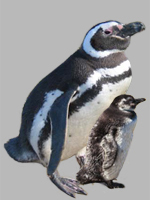 They breed on sub-Antarctic islands southern of Africa and America. They lay 2 eggs, but only hatch out just one. Incubation : 35 à 37 days. Habitat : Kerguelen, Crozet, Falklands, Prince Edward and Marion, Heard, South Shetlands, South Georgia, South Sandwich, Bouvet, Chili. © Kevin Schafer Royal penguins sometimes are subscribed as a sub-species of the macaroni but with a white chin. They are only found on Macquarie Island, southern of New Zealand/Australia. As far as I know, they can't be found in a zoo. Little blue penguins (Fairy or Kororaa) live on the southcoast of Australia and Tasmania, in New Zealand and many islands around it. Chatham Islands and Cook Strait penguins belong to this species too. Habitat : northern New Zealand, southern Australia. Population : less than 500 000 pairs? White flippered little penguin: some describe it as an 18th species, but mostly they are considered as a subspecies of the little blue penguin. Habitat : New Zealand South Island, Banks Peninsula. © Rutger Geerling Yellow-eyed penguins (Hoiho) live on New Zealand´s South Island and on several sub-Antarctic Island, southern of New Zealand. On the mainland of New Zealand they are rarely found (very shy) and endangered. They founded a special Yellow-eyed Penguin Trust for conservation of their habitat and species. 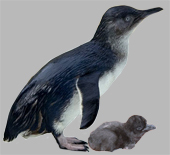 Dave Houston, ranger, has an informative site about yellow-eyed penguins in New Zealand. Photo, used with permission, by Rutger Geerling.